Eric Martinez has served as a storage consultant at Encinitas Self Storage since February. He resides in Encinitas where he enjoys the safe community and nearby beaches. 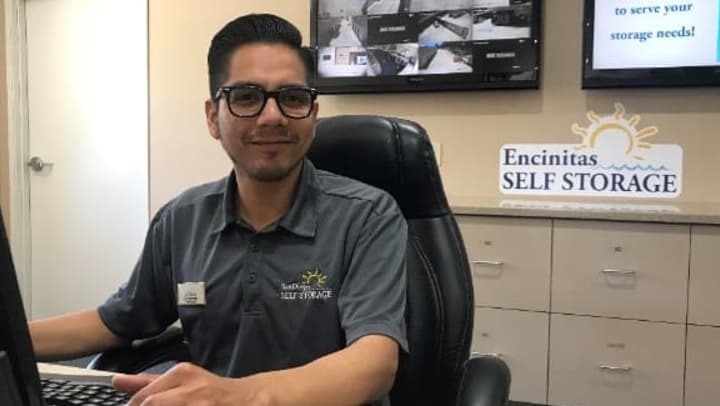 His favorite thing about working for San Diego Self Storage, besides the location, is the staff members because they make him feel like he is part of a great team. In his spare time, Eric enjoys studying finance and keeps up with finance networks or vlogs. He likes to get outdoors to hike, surf or travel when he can. His priority on Sundays is to play soccer, a sport he has played since he was a child. Eric previously worked as a DJ for about 4 years and had an extremely great time doing so, but now enjoys going to reggae or house concerts. Thank you for your great service at Encinitas Self Storage, Eric! We enjoy having you on our team!